Everyone had a rough day today. I woke up late and felt like poo. The sun never came out and there was a constant drizzle that just seemed to make the kids a little extra whiney. We skipped the gym (never a good decision) so our routine was just off. I called Chris a work a bunch this morning and he wasn't answering which was weird. When he finally called me around 11 from his cell phone I knew that wasn't a good sign. He was still at school! One of his group members totally dropped the ball on their big finals project that is due tomorrow and he had already called work and told his boss about it and that he'd need a half day to stay there and fix things. So I knew he was having a rough day too. There were a million things I needed to get done during nap time and I had no energy to do it. This day was not getting better. Then at quarter to 4 my cell phone started blowing up with texts from Chris. His day was definitely not getting better either. I called him back and he was still at school! That half day had turned into a whole day and he was pretty tired of trying to fix the badly botched job his group member did. So I declared, "We need a family fun night!" We were supposed to go get our Christmas tree tonight but that was ruined (see nasty rainy day above), so we really needed something to do. I dug through the junk on the top of the dresser to find the Putt Putt cards from the company picnic. We like to save the game cards and use them on some random week day when the place will be empty and our kids can run around. It worked last time, so we went with that theory and again we were not disappointed. I think on this dreary Thursday there were about 15 people inside Putt Putt, counting the employees. It was great! And instead of the normal $2 per card, this year they apparently gave everyone $5 per card, so we had quite a bit of arcade money. Wahoo! 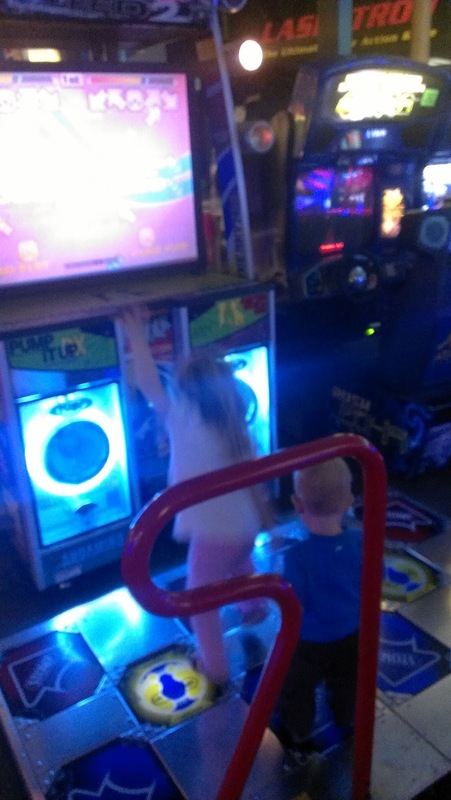 The kids were mostly attracted to the button mashing games where the light just spins around and you try to stop it in a certain color zone. 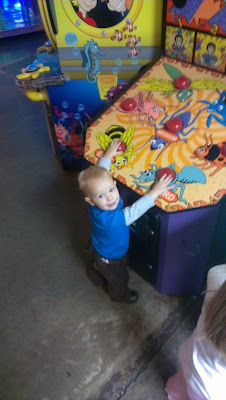 Then they found the bug themed whack-a-mole type game and we all had a great time with that. 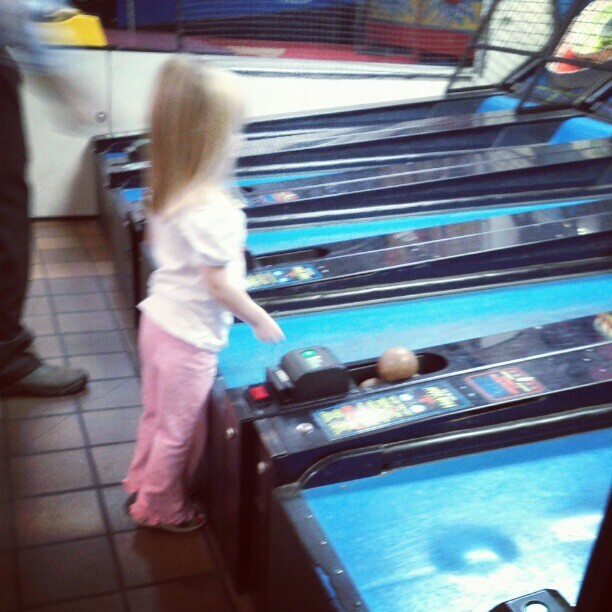 We tried to teach them the finer points of Skeeball. I helped Cody throw his skeeballs up the ramp and we actually managed to score zero points. Impressed? 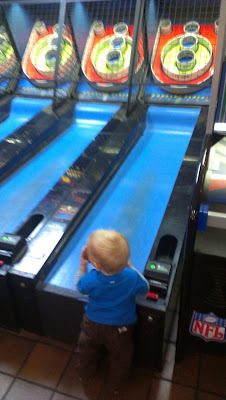 Skeeball was by far his favorite game. He kept wandering back off to that while Sarah was playing the fishing game. Then I wandered off to my favorite game, the basketball one. They've changed out the machines and now it's not the kind where the goal moves. I'm going to blame that for my poor performance, only 64 points. No where near my high score. I have no idea why I love that game so much but I am seriously addicted to it, like I will play until my calves cramp up. It's bizarre. Anyway, while I was over there Chris took the kids to the dance game to let them get their grove on. And now for your viewing enjoyment, I present Sarah and Cody's DDR debut. I think we managed to turn this bad day around. Everyone had a great time at Putt Putt. They earned enough tickets that they each picked out a few things from the junk shop, I mean, prize desk. Sarah got a curly straw, bracelet, and ring. Cody got a little soccer ball and a barrel of monkeys. And we still have about 100 points left for next time. That is assuming we don't lose the little point receipt before next year's company picnic.